THIS SPACE BELONGS TO YOU. Looking for a place to hold your community meetings? 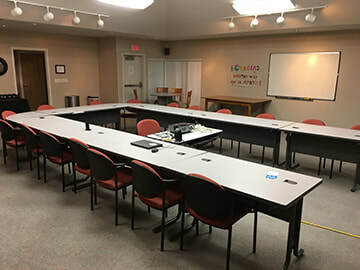 The United Way Community Center is available for use by non-profit organizations. The room can accommodate groups up to 40 people. The Community Center is located at the United Way of the Mid-Willamette Valley's office at 455 Bliler Avenue NE in Salem, Oregon. United Way is proud to hold an EarthWISE certification. EarthWISE Certification recognizes businesses in Marion County that have made a commitment to environmentally friendly practices. Organizations wishing to utilize catering as part of the room usage are asked to read, sign and return our Green Catering Policy form along with the official room reservation form. If you have questions, please contact Annie Chapman at (503) 363-1651. United Way’s Community Center may be reserved by any local 501(c)3. Reservations must be made at least 2 weeks in advance, to guarantee availability but no more than 3 months in advance. The Community Center is available between the hours of 9am and 4pm Monday through Thursday. This will ensure proper staffing in the building. Occupancy is limited to 40 persons in the Community Center. Tables and chairs are provided in the rooms and must stay in the rooms. Tables and chairs can be arranged in any way needed for the reservation. They must be put back in their original configuration at the end of the reservation by the occupants. The room is equipped with a dedicated laptop and projector for presentations and trainings. A wireless conference phone is available upon request. Teachers are our First Responders for our children. They are the ones who help the child who comes to school with duct tape around their shoes, or the child who didn’t have breakfast - or even dinner. We’re learning more how the impact of poverty upon education shows a measurable and long-lasting detrimental effect on students’ cognitive performance. Currently, our teachers are spending an average of $600 of their own money to combat the impact of poverty in their classrooms. United Way wants every child to have the best possible chance to succeed, which is why we are proud to announce the launch of United for Classrooms. The United for Classrooms initiative gives $200 of financial assistance to each K-5 classroom in Marion, Polk and Yamhill County. These funds can be used to purchase a winter coat or new shoes for a kid whose family is in crisis, or to purchase educational tools to help kids better grasp the material and stay on grade-level. ​We’re asking the community to step up, raise their hand, because we want this to be a program with lasting, measurable impact. You can help, too.